Behind our team’s friendly faces lies decades of cumulative dental experience. In addition to making sure your appointments run on time and are well-organized, they’ll also help you feel right at home starting at your very first visit. Our team is always willing to go above and beyond for our patients, to the point that if you ever need a ride to our office, they’ll be more than happy to give you one! To learn more about our fantastic staff, read on below. 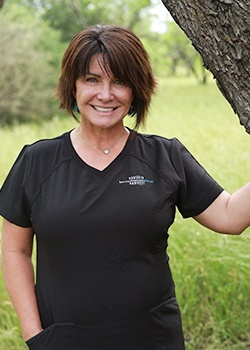 Gloria finds it so gratifying to work with the Horseshoe Bay Dental team and enjoys constantly learning in order to provide patients with the best experience and quality of care possible. She studied at Northern Essex College and has her Associates of Science in Physical Therapy. In the past, she’s worked as a medic in the United States Army and an operating room attendant. Outside of the practice, Gloria is the proud mother of three grown children. She spends her free time skiing, hiking, and playing golf. She also used to show reining horses, which is one of her all-time favorite experiences! 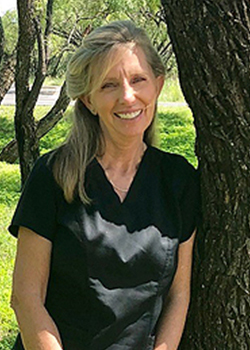 Susan completed her undergraduate education at Texas State before studying dentistry at Del Mar College in Corpus Christi. Today, her career in this field impressively spans nearly 40 years! She is certified in pit and fissure sealants and nitrous oxide. She adores her dental “family” here in Horseshoe Bay! At home, Susan is proud to hail from the biggest Aggie family ever, which includes her husband and two sons. Her hobbies outside of work include exercising, going on long walks, gardening, rescuing dogs, tail gating, and spending quality time with loved ones. She also wants to learn Yoga and open her own studio one day. Ashton studied dentistry at the University of Louisiana at Monroe, and today, her career in the oral healthcare field spans nearly a full decade. What she enjoys most about her work is having the privilege of meeting so many different, wonderful people throughout each day! Outside of work, Ashton was recently blessed with her first baby girl in early February of 2019. She spends her free time outdoors in the sunshine, traveling to new places, and dabbling with interior design. She’s also a total foodie and always enjoys trying new dishes! If you want to make her happy, offering a snack is definitely the way to her heart. Diana originally hails from Ingleside. She is a Registered Dental Assistant and certified in nitrous oxide monitoring. What she enjoys most about her position is being able to help people learn so much about the importance of dental health! Outside of work, Diana spends lots of quality time with her four grown children, seven grandchildren, and one special great-grandchild. She also enjoys crocheting, cross stitching, watching movies, and reading a good book. She considers herself a very loyal and caring person. 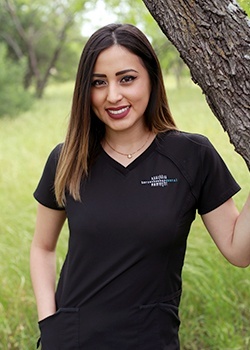 Stefani earned her education at Central Texas College and is currently working towards becoming a dental hygiene through continuing education courses. She is a Registered Dental Assistant, CPR-certified, and certified in nitrous oxide monitoring as well. She is a true people person and takes plenty of quality time with each patient to show them the compassion they deserve. She also loves her coworkers a lot! Stefani is originally from Granite Shoals and adores her tiny hometown. She has a fun, outgoing family, including a little brother who keeps her young. Outside of work, she spends her free time traveling, running, working out, playing around with her dog Chief, and trying lots of different cuisines/restaurants as a big foodie. 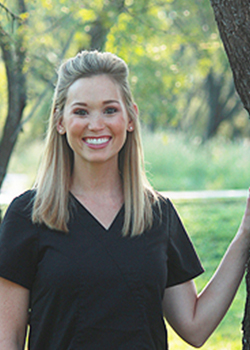 Originally from Houston, Jen attended Wharton Junior College and has also trained in pit & fissure treatment, nitrous oxide, and laser dentistry. 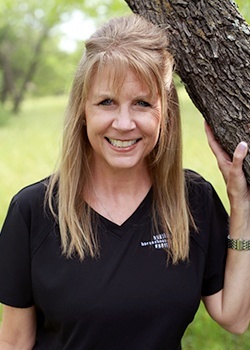 Today, her career in the oral healthcare field spans well over three decades! 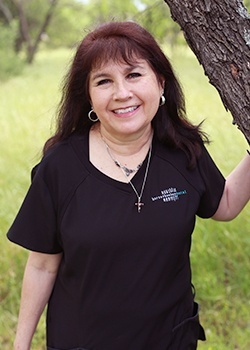 She loves taking good care of her patients and helping them achieve excellent oral health here at Horseshoe Bay Dental. Jen is the proud single mom of one daughter and also spends a lot of her free time taking care of her own mother. Personal hobbies include playing tennis (and watching her daughter play too), shopping, listening to live music, and going on trips with loved ones. She also regularly volunteers and strongly believes in the power of giving back to others.